Mrs. Faye brings a very versatile product that can be used in many different ways! - Assign one problem a day! - Students complete one question each night and take up as class the following day! 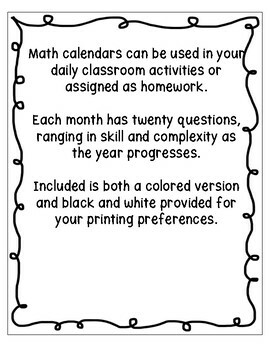 - Assign whole calendar for given month as homework and students can work at their own pace to finish. Collect at the end of the month to track progress and understanding. 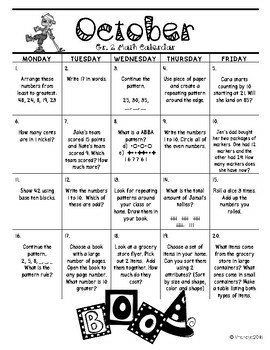 - Have students complete desired amount of questions during math centers. Calendars make it easy to check off what questions have been completed. 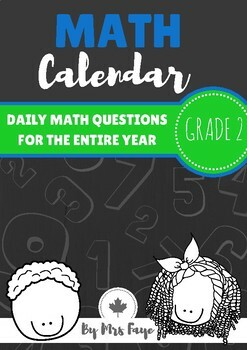 Package includes a whole school year of grade specific math questions laid out in a calendar format making it a fun way to address all math strands throughout the year. 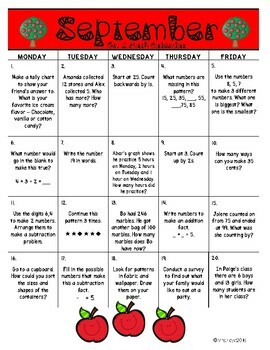 Each calendar has twenty questions which vary in math skill and complexity. This will allow your students to be continually addressing skills and concepts previously taught throughout the year.